I’m still limited in my mobility while trying to avoid the coughing that results with physical exertion so, with sweatshirt #1 completed, I moved on to sweatshirt #2. This time I was inspired by a posting on Pinterest. The first posting I found was by Rachel Hatch and appears to have been woven with cotton broadcloth strips. However, when I followed her links to my inspiration it led, via Danielle Schulz, to the original posting at The Forge where ‘jersey’ strips had been used – and instructions provided! I liked the drape of the second example so raided my Goodwill bin for a T-shirt recently discarded and grabbed another of my springtime end-of-season sweatshirt purchases. 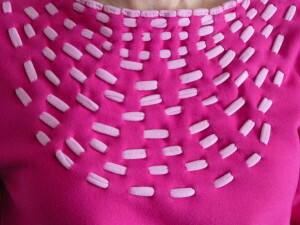 The end result was, what I consider to be, another highly wearable ‘up-cycle’. I added my own touches – at the neckline and the sleeves. They were left unfinished on the original posting but I have used a lined turn-back sleeve finish in the past and as the t-shirt had long sleeves, opted to use them to finish the sleeves in this manner. 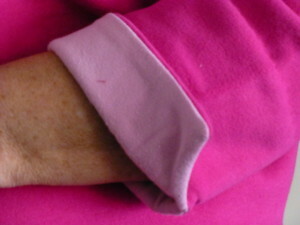 I used the bottom hem of the t-shirt to cover the front neckline where the ribbing had been removed to relax the fabric. When completed, I didn’t like the solid band across the top so folded it in half and hand-stitched a picot edge that helps it to blend with the woven strips. 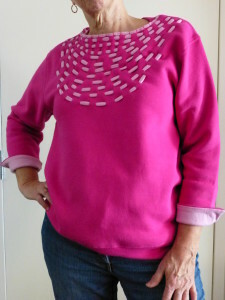 By leaving the back, reinforced section of the neckline, I have some stability in the finished neckline – which for me is good.